River Class work in their job teams to help plant lettuce. Our first group of students digs trenches. We have our very own garden square. Students take turns to use the shovels. Each job team helps to either dig or plant seeds. We have fun working together. 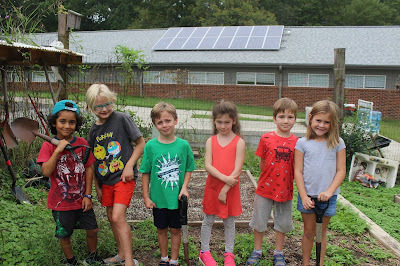 We hope to have a salad bar when the lettuce is ready to harvest. We'll keep you posted. During research time we have the kids work in groups to solve problems together. Last week's challenge was to come up with 20 different sounds. Our second-year students modeled how to work cooperatively in a group by listening to one another and taking turns. Children get lots of practice over the course of the year. A team leader helps organize the group. An older student is typically chosen for this role. However, as the year progresses, first-year students often volunteer for this task. We will be working on our theme of SOUND over the course of the year. 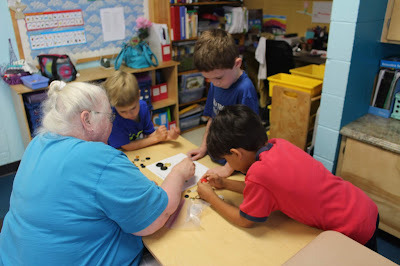 In this math activity, students worked in small groups to identify and record shared attributes found in a quantity of buttons. In general, an attribute is a characteristic or property of an object such as color, shape, size, etc. Students first decided how to group their buttons into 3 groups by size. They then re-sorted their buttons by number of holes, then by color, and finally by a characteristic of their choice. Sorting and patterning skills involve understanding relationships among sets, how those sets are represented, and analysis of those sets. By sorting, children understand that things are alike and different as well as that they can belong and be organized into certain groups. This type of thinking starts them on the path of applying logical thinking to objects, mathematical concepts, and every day life in general. - How might you group your collection of stuffed animals? Can you find more than one way?